PS. Since there may be misunderstanding - the question is not specifically about UK or England. Baker Street is just an example. It could be Bakkerstraat 22 in Anwerpen as well (not a museum or any point of interest, just a normal house where people live). This answer has evolved slightly since comments changed the OP's intent. It now generally covers Apple Maps & how it stores & searches locations. Sherlock Holmes is less relevant, but it's still a valid start point for the rest. This is also pertinent to macOS as well as iOS, they both share the same structure. House numbers come first in the UK. Sherlock's Address is 221B Baker Street. As it's such an iconic [if actually completely fictitious] address, simply typing 221b will find it. Again, because it's a well-known landmark, Maps does have a specific Point of Interest for it. In short - learn the postcode & search that. Let's take a much broader example. I live on Church Street. Can you imagine just how many Church Streets there are in the UK? - there are 2 within a mile of here so even locally that's a difficult distinction. If I start typing an address on Church Street [not mine, it knows where I live, of course] but any other number along the road, then it's not even going to hone it to less than a screenful of alternatives until I start the postcode section, which will rapidly hone it to town, then district & finally the correct location. Amusingly [well, vaguely amusingly] my barber shop has the same address as I do; distinguishable only by the postcode. I can't really add any generalisation for outside the UK, as that's the only system I know - but you can test it for your own local 'postcode' structure, see below. A Postcode in the UK is a "potential set of numbers in a given distance on a road [or roads - this changes depending on the population density]." Those numbers fall inside that postcode whether or not they even exist, in case the buildings change over the years. Important & large organisations can have their own 'personal' Postcode - famously, BBC Radio 1 is W1N 4DJ although W1N is actually a valid postcode for where the office is - they couldn't have picked R4D 101 etc, it had to come from the pre-determined pool. The postcode is the only real stored reference for an Apple Map POI & especially once saved as a contact or favourite [other maps do it differently, but Apple Maps does it this way, even if you enter data in actual international mapping designations initially.] This is the limit of its resolution once saved. As a simple Dropped Pin it retains accuracy, but as soon as it's saved it loses that & drops back to 'postcode' as its finest granularity. You can test this storage method & whether it also applies to your own country's 'postal code' system by the simple but tedious expedient of saving a location which is inside a geographically large single postcode, saving it as a Contact or Favourite then recalling it - it moves to the centre of the postcode, wherever you had set the POI initially. This is actually what I have always considered a major failing in Apple Maps & I've reported it many times, from both a user & beta tester perspective. Not the answer you're looking for? Browse other questions tagged ios maps . 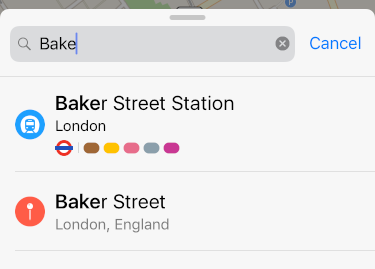 Is there any iOS offline maps app which also supports searching for an address offline? Why doesn't Apple Maps find an address that contains a suite letter? How can I use a different navigation app from within Maps?